Who has not dreamed of a child with having a house in a tree? If we do not get it in childhood, we will have the opportunity to re-take us for adults, looking for some where it is possible to stay. 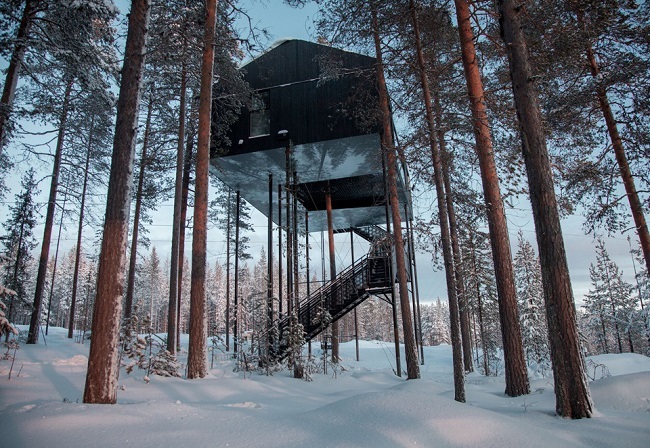 There are several places in the world, but we have not found any more spectacular than the one that just opened Treehotel in Sweden, a stone’s throw from the northern lights. Because sleeping in a tree house can be a dream, but if we add to the spectacular vision of a green sky, the experience is quite close to perfection. Treehotel is a Swedish hotel specializing in tree houses. So far, they had six of these cabins, all of them located between 4 and 6 meters above the ground. Now they open the 7th Room (“seventh room”), much higher than the previous ones, almost 10 meters high, between pine logs and with a perfect adaptation to the Swedish forest environment. The house, decorated on the outside with a life-size reproduction of how the trees were before the construction of the cottage, has 56 square meters, divided into two floors. Downstairs, guests can relax in a lounge with panoramic windows and, if they withstand the cold, a terrace from which to be even more in touch with nature. In the upper, two double bedrooms, a bathroom and another living area, all decorated in pure lines and with all details. The house can accommodate up to five people, for prices ranging, depending on the season, between 12,000 and 15,000 Swedish crowns. If we are willing to travel to the north of Sweden and pay the prohibitive fee, we will only cross our fingers so that the northern lights decide to make their appearance on the chosen night.